Join us as we hear from Professor Margaret Sheil AO, QUT Vice-Chancellor, who will discuss effective models, strategies, and example breakthroughs of a successful national research environment. Through the 20th century, research laboratories at the Universities of Oxford and Cambridge embodied two leading models of research, based on competing philosophies of how research is conducted and research teams are assembled and supported. The Cavendish Laboratory at Cambridge, under the guidance of J.J. Thomson and his acolytes, focused on recruitment and environment, producing a stunning succession of discoveries that underpin modern physics and chemistry. Several decades later, Howard Florey’s team at Oxford took a problem-based approach, carefully assembling the team best equipped to solve the antibiotic challenge, resulting in the discovery that has arguably saved more lives than any other. Towards the end of the 20th century and on the other side of the world, policymakers and research administrators came together to develop a blended system that harnessed the best of each of these models. For more than a decade and supported by successive Australian governments, Backing Australia’s Ability provided a coherent, overarching structure to nurture a research ecosystem in which each element could thrive in collaboration with the others. Professor Sheil will argue that examples of breakthrough innovation – such as the cervical cancer vaccine or CSIRO’s invention of Wi-Fi – must be read in the context of this ecosystem approach, which underpinned a research model that is at once engaged yet open; problem-oriented yet curiosity-driven. This Grand Challenge Lecture is a call to arms for a revival and modernisation of such a systems approach, in which government, the universities, industry and the publicly funded research agencies each understand (and are funded for) their respective roles, yet find benefit in working collaboratively and generatively, within the most productive open-source template for adaptive innovation in the world of today and tomorrow. 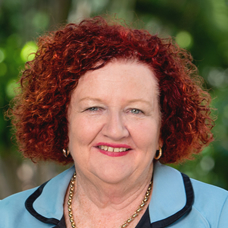 Professor Margaret Sheil AO FTSE FRACI FANZSMS is the Vice-Chancellor of QUT, a position she took up in February 2018. She has a PhD in Physical Chemistry from the University of New South Wales and is recognised for her distinguished service to science and higher education as an academic administrator, through significant contributions to the national research landscape for funding and evaluating research. Professor Sheil has served on numerous advisory boards and committees and provided expert advice to government, and is currently a Director of the Australian Nuclear Science and Technology Organisation. Professor Sheil’s previous roles include Dean of the Faculty of Science (2001-2002) and Deputy Vice Chancellor (2001-2007) at the University of Wollongong, and as CEO of the Australian Research Council from 2007-2012. Prior to joining QUT, Professor Sheil was Provost and Chief Academic Officer of The University of Melbourne (2012-2017).